Southampton reached the EFL Cup final at Wembley with a fully deserved victory over two legs against Liverpool - crowned by Shane Long's late winner at Anfield. Claude Puel's side, defending a 1-0 lead from the first leg, should have put the tie out of Liverpool's reach inside the first 45 minutes but Dusan Tadic's close-range shot was blocked by keeper Loris Karius and captain Steve Davis blazed another great chance wildly over. Liverpool raised the tempo in front of the Kop in the second half but Daniel Sturridge wasted their two best chances, Fraser Forster acrobatically hooked an Emre Can shot off the line and the hosts also had a late penalty appeal turned down when substitute Divock Origi tumbled under Jack Stephens' challenge. But Southampton broke clear in the closing moments and Long finished convincingly from Josh Sims' pass to send them into the their first final in this competition since 1979, where they will meet either Manchester United or Hull City - a feat achieved without conceding a goal. Southampton's date at Wembley on 26 February is a rich tribute to this brilliantly run club and their understated French manager Claude Puel. Saints were vastly superior over two legs against Liverpool and, despite the home side's complaints about that late penalty claim, no-one could seriously begrudge them their victory. And it was all done without their talisman and key defender Virgil van Dijk, out through injury. Southampton were dangerous on the break in the first half and then, when they needed to be, were superbly organised, disciplined and determined defensively before breaking for Republic of Ireland international Long to strike the killer blow. Southampton have once more demonstrated their ability, as a club, to take the blows of key departures and still achieve. They lost manager Ronald Koeman to Everton in the summer - as well as important components such as Victor Wanyama and Sadio Mane to Spurs and Liverpool respectively - and have carried on undisturbed with a Wembley appearance as their reward. Liverpool's laboured performance was in stark contrast to the all-action attacking displays that briefly took them to the top of the Premier League earlier this season. Jurgen Klopp's side looked jaded and have lost their way, with only one win in seven games this year, a third-round FA Cup replay victory at League Two Plymouth Argyle. Liverpool look shorn of threat without £34m summer signing Mane, away at the Africa Cup of Nations with Senegal, and lacking an alternative plan when teams as disciplined as Swansea and Southampton have been in inflicting two successive home defeats. Sturridge felt the frustration of Liverpool's supporters for a poor performance and two missed chances, while substitute Origi looks short of confidence. Klopp's decision to play Can and Jordan Henderson together in midfield backfired badly and his decision to leave out Georginio Wijnaldum was questionable. Southampton's players enjoyed every second of their celebrations with their fans in the Anfield Road end as they looked forward to the chance to win their second major trophy, following an FA Cup triumph over Manchester United at Wembley in 1976. 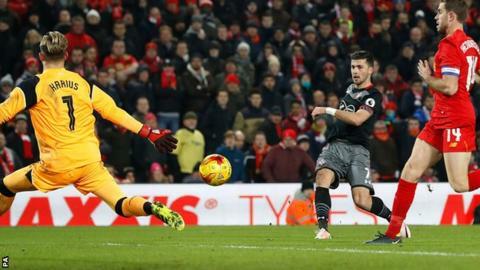 Saints had several anxious moments in the second half, especially when goalkeeper Forster dropped Can's shot behind him then recovered miraculously to claw it off the line as Sturridge closed in. They also survived two penalty appeals - for handball against Long and that fall from Origi - but this was a glory night for Southampton and one they fully deserved. BBC Radio 5 live pundit Mark Lawrenson: "Absolutely, totally and utterly deserved. They always, always carried that goal threat. They played with so much pace, so much directness. Over the two legs they have totally outplayed Liverpool. They thoroughly deserve the Wembley appearance." This is the first time Jurgen Klopp has lost a semi-final as a manager, progressing from the previous six. Southampton have reached the final without conceding a single goal. Liverpool have failed to score in all three games v Southampton this season in all competitions. Claude Puel is unbeaten in six games against Liverpool as a manager (W3 D3). This is just the second time Liverpool have been eliminated in six League Cup semi-finals (the other v Chelsea in 2014-15). The last time Liverpool failed to score in either leg of a semi-final was in the 1970-71 Fairs Cup v Leeds. Southampton manager Claude Puel: "It is fantastic for all the squad and a good reward for their hard work. It was difficult to find this opportunity to play a final at Wembley. In the two legs we deserved the win. We were fantastic in the first leg at home and tonight we had chances in the first half. "In the second half it was difficult but now we go to Wembley, not just to participate but to win this cup. I have been there once, just to watch France beat England." Liverpool manager Jurgen Klopp: "They won both games, they deserved it. We did really well. We cannot create more chances than we did in the second half - we were dominant. It is difficult because you have to take risks but too many risks plays to their strengths. "We had seven good chances. You have to score, and we didn't do, so we lost. I'm fine with the performance but not the result." Liverpool host Championship side Wolves in the FA Cup fourth round on Saturday at 12:30 GMT, while Southampton travel to Arsenal in the same competition at 17:30. Match ends, Liverpool 0, Southampton 1. Second Half ends, Liverpool 0, Southampton 1. Goal! Liverpool 0, Southampton 1. Shane Long (Southampton) right footed shot from the right side of the box to the bottom left corner. Assisted by Josh Sims following a fast break. Corner, Liverpool. Conceded by Jack Stephens. Substitution, Liverpool. Georginio Wijnaldum replaces Philippe Coutinho. Attempt blocked. Roberto Firmino (Liverpool) right footed shot from the centre of the box is blocked. Corner, Liverpool. Conceded by Oriol Romeu. Attempt missed. Philippe Coutinho (Liverpool) right footed shot from outside the box is close, but misses to the right. Assisted by Adam Lallana. Attempt blocked. Roberto Firmino (Liverpool) right footed shot from the centre of the box is blocked. Assisted by Emre Can. Corner, Liverpool. Conceded by Dusan Tadic. Corner, Southampton. Conceded by Dejan Lovren. Attempt blocked. Pierre-Emile Højbjerg (Southampton) right footed shot from the right side of the box is blocked. Assisted by Nathan Redmond. Attempt missed. Philippe Coutinho (Liverpool) right footed shot from the centre of the box misses to the left. Assisted by Roberto Firmino with a cross. Attempt missed. Daniel Sturridge (Liverpool) right footed shot from the centre of the box is too high. Assisted by Jordan Henderson with a cross. Attempt missed. Daniel Sturridge (Liverpool) left footed shot from very close range is too high. Substitution, Southampton. Pierre-Emile Højbjerg replaces James Ward-Prowse because of an injury. Corner, Liverpool. Conceded by Ryan Bertrand. Delay in match James Ward-Prowse (Southampton) because of an injury. Attempt missed. Daniel Sturridge (Liverpool) header from the centre of the box misses to the right. Assisted by Emre Can with a cross. Attempt saved. Emre Can (Liverpool) right footed shot from outside the box is saved in the centre of the goal. Assisted by Philippe Coutinho. Attempt blocked. Philippe Coutinho (Liverpool) right footed shot from outside the box is blocked. Assisted by Adam Lallana. Corner, Liverpool. Conceded by Maya Yoshida. Second Half begins Liverpool 0, Southampton 0. Substitution, Southampton. Shane Long replaces Jay Rodriguez because of an injury. First Half ends, Liverpool 0, Southampton 0. Attempt missed. James Ward-Prowse (Southampton) right footed shot from outside the box is close, but misses to the left. Assisted by Dusan Tadic following a corner. Corner, Southampton. Conceded by Emre Can. Attempt missed. Steven Davis (Southampton) left footed shot from the centre of the box is too high.